Easter Island called as the Rapa Nui is a Chilean island in the Southeastern Pacific Ocean. It is one of the youngest inhabited territories on Earth and also among the most isolated territories. 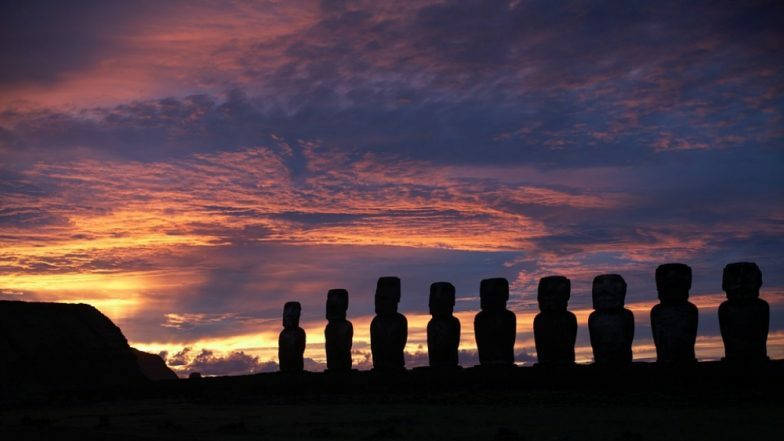 It is most famous for the extant monumental statues, called moai. It is a UNESCO World Heritage Site since the year 1995. As Easter Sunday is also approaching on April 21 this year, is there any connection between this place and the festive holiday? Well, there is as the island was discovered on an Easter Sunday. Dutch explorer Jacob Roggeveen was sailing in the South Pacific ocean when he discovered this island on April 5, 1722. Easter Island: Moai Statues on One of The World's Most Remote Islands is Under Threat of Global Warming. Jacob Roggeveen is the first recorded explorer from Europe who visited this island. He was searching for the Davis Land when he came across this land on the southeasternmost point of the Polynesian Triangle in Oceania. Roggeveen named it Paasch-Eyland (Dutch for Easter Island). The name of Easter Island has stuck throughout since then. The other name for this island is Rapa Nui ("Big Rapa") which was given after the slave raids of 1860s. The inhabitants here are also referred by the same name. Rapa Nui has a sad history to its name which is derived from the slave raids. The slavers abducted the island dwellers here and confused it with another island name, Rapa. Moai are monolithic human figures carved by the Rapa Nui people on Easter Island. They belong to the year between 1250 and 1500. They are said to be the living faces of deified ancestors. The Easter Islands are known world over for the Moai statues. Easter Island: Here's Why Rapa Nui's Statues Stand Where They Do. Early European to Easter Island recorded the oral traditions of the original settlers. The early islanders have been Polynesian. Easter Island was annexed by Chile in the year 1888 and in the year 1966 it was granted the Chilean citizenship. The island gained the constitutional status of "special territory," in the year 2007. It is now considered as a part of Insular Chile. Today, it is one of the most inhabited islands in the world.